Trommel screeners have been extensively used to screen all kinds of wet or dry powder, sand and small particles. Small trommel screen can screen all-sized of materials, such as medium coarse materials and fine grained materials. In general, trommel screens are mainly composed by vibrating screen, driving system, screw conveyor and the chassis. 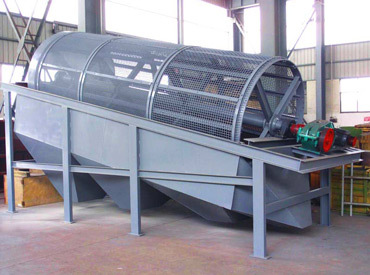 The vibrating screen of trommel screener is a cylindrical or hexagonal drum, and the driving system mainly consists of driving engine and reducer. Materials are put into the feeding port firstly, and then it will be lifted into inner side of screening drum by screw conveyor. With the continuous rotation of the screening drum, materials will finish classified screening through different size of screen mesh. Mobile trommel screen is a key component of various construction machines, such as concrete batching plant, asphalt mixing plant, dry mortar production line etc. The unique design of the layout of screen mesh can effectively avoid the blocking and clogging of materials. The cylindrical screen mesh has larger screening area, which can totally meet the demand of large-scale screening operation works. It is equipped with sealed isolation cover, which can greatly avoid noise pollution in the working process. There are two observation window, which will be easy to maintain and handle working breakdowns. Our company distinguishes from other trommel screen manufacturers in our favorable price, high-tech products and good screening performance. 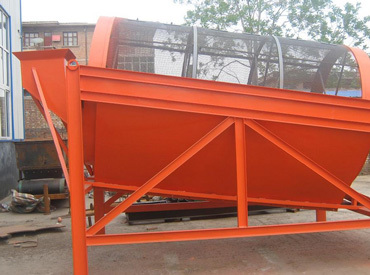 Before drying, our trommel screening can undergo pre-screening of wet sand to remove inappropriate sand, which can ensure that all the drying materials will be useful, and it can also save energy and improve working efficiency. Our trommel screener for sale has passed lots of famous certifications, and it has got the recognition of worldwide customers. The components of our machine adopt world famous brand, which makes it more stable and reliable. Specifically, our trommel screen equipment for sale has high screening quality and efficiency, which can make full preparations for the continuation of your construction works. If you are interested in our trommel screens for sale, welcome to contact us for detailed information.